Habit: Annual to perennial herb, generally fleshy. Stem: several to many, spreading [to erect], generally glabrous. Leaf: simple, alternate or opposite, linear, obovate, spoon-shaped, [elliptic, +- round], flat or cylindric, hairs in axils, inconspicuous or not , upper 2--5 forming involucre. Inflorescence: flowers 1 or clustered at stem tips. Flower: bisexual, radial; sepals 2, fused at base, lower part fused to ovary and generally persistent in fruit; petals 5, fused at base, forming ring, yellow [magenta, rose, orange, white]; stamens 4--20[> 20], epipetalous or not, anthers yellow; ovary 1/2-inferior, chamber 1, ovules several to many, placenta free-central; style branches 3--6. Fruit: capsule, circumscissile. Seed: many, reniform, +- tubercled, black, gray, [brown, +- blue]. 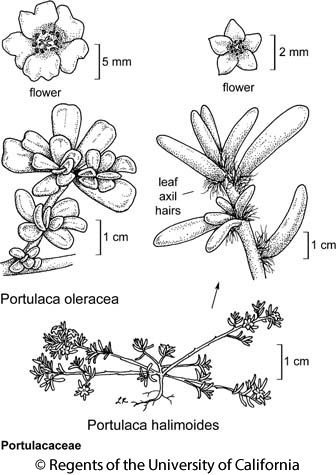 Genera In Family: 1 genus, +- 100 species: +- worldwide, especially tropics, subtropics some cultivated (Portulaca grandiflora Hook. ; Portulaca umbraticola Kunth). Note: All other California genera previously in this family now in Montiaceae. Habit: Annual. Stem: spreading to ascending, 2--15 cm. Leaf: 3--15 mm. Inflorescence: flowers 2--8. Flower: sepals 1--2.5 mm, generally +- red; petals 1.5--3.5 mm, yellow; stamens 4--18; style branches 3--4. Fruit: 1.5--2 mm wide. Seed: 0.3--0.5 mm wide, black or metallic silver. Chromosomes: 2n=18. Citation for this treatment: Gilberto Ocampo 2012, Portulaca halimoides, in Jepson Flora Project (eds.) Jepson eFlora, http://ucjeps.berkeley.edu/eflora/eflora_display.php?tid=39526, accessed on April 19, 2019. © 2002 Thomas M. Elder, M.D. PR, DSon, DMoj; Markers link to CCH specimen records. Yellow markers indicate records that may provide evidence for eFlora range revision or may have georeferencing or identification issues. Purple markers indicate specimens collected from a garden, greenhouse, or other non-wild location.